Bruno Pignatiello was born in Rome, and only in recent years he matured the awareness of being born in a city of extraordinary beauty and ordinary chaos. Bruno enjoys listening to all the sounds and languages of the world but he prefers, above all, those coming from Brazil and the Lusitanian areas. A Bachelor of Arts, in the linguistic field, he likes to write the lyrics of his songs in Portuguese, which has now become a kind of adoptive language. At the same time he does not neglect his Italic roots or the English language which is his first cultural passion. In the past, before making some trips abroad (Brazil, Portugal, Canada, Greece, Great Britain), Bruno devoted himself to the divulgation of the music performed by some Brazilian artists belonging to the “geração roqueira”. I would like to extend my gratitude to you for taking the time to answer a few questions and sharing your insights with us. If you don’t mind can you please introduce yourself for many of our readers who may not be familiar with you yet? Who is Bruno Pignatiello, and where is he from? Bruno Pignatiello: First of all I would like to say “Hi” to all your readers and listeners as well. Thank you Rick for giving me this opportunity to gain exposure for my music. I’m a Christian, Italian singer and songwriter and I was born in Rome in 1966. Also, I really appreciated some Italian artists of the pop scene as Renato Zero, Eugenio Finardi and Alberto Camerini the latter brilliant up to paroxysm. In more recent years, I have listened to many Brazilian artists as well….We’re talking about very talented musicians such as Gilberto Gil, Caetano Veloso and Cazuza. Do you still find time to listen to other composers and artists? And if so, which of these do you currently admire? Bruno Pignatiello: I’m always interested in new music above all the music coming from independent musicians. Nowadays I really love the art of Caleb and Sol and Marisa Frantz, artists who really touch your heart with their singing and poems. How did your interest in Brazilian and Lusitanian-based culture and music begin? I know you currently have a song in your catalog that is special to you. Could you tells us more about “The Angel Flight” and its significance to you? The song talks about the love between my parents and their love for us children. The Angel Flight means very much to me because it’s the flight of my parents to Heaven. One of your most appealing songs has to be the “The Elegant Man”, which is inspired by the story of Joseph Merrick, the so called “elephant man”. What drove you to write the song, and why that specific title? He asked his friend, doctor Treves to go to live at a hospital for the blind, where he might meet a woman who could not see his deformities and could appreciate him for the beauty he had inside. I must confess that “Measured by soul” a book about the story of Joseph Merrick was going to influence me in choosing the title of my song: it’s such a beautiful and powerful title, but you know….It wasn’t mine so respect for the others’ work and let’s free our creativity! Finally, I made up my mind to title the song “The elegant man” to tell the world that Joseph Merrick was a man and not “the elephant man”. In my song the deformities of Joseph Merrick are the deformities of the world where we live in these days… and if we are created in the image and likeness of God “blaming him is blaming God”. I quoted and paraphrased a sentence by the English poet Isaac Watts, very dear to Joseph Merrick. Since you started out, a key part of your musical life has been, and still is, collaboration with other creatives. What makes you so passionate about collaborating and sharing your work with others? Let’s talk through some of your collaborations and what made or makes them special for you. For instance, your work with Marisa Frantz? Bruno Pignatiello: I listened to Marisa Frantz’s music by chance. The beautiful, deep and intense singing of Marisa gave me a lot of courage when I lost my parents; she transmitted to me deep vibrations so – some months later – I decided it was time to collaborate with this wonderful human being and very talented musician. Our first creation together is The Angel Flight indeed: the song is a precious pearl that the violin and the voice of Marisa relegate to eternity. Also tells us about your earlier work with Fulvio Previdi? Bruno Pignatiello: I owe very much to Fulvio. He was the first person to believe in me when all my friends laughed at my work and it would be great to work with him again because we share the same vision of music. And lastly, tells us something about your current work with Guido Aulisi? Apparently fans have been asking you the reason why you say “So here is the seventies” instead of “here ARE the seventies” or better “here COME the seventies”, in your song 1966. Could you enlighten us on this issue? Bruno Pignatiello: 1966 is a biographical song talking about a kid who was four years old in the beginning of the seventies, so I wanted to provide the portrait of a child who is learning to write and speak correctly but at the same time I wanted to represent the child with his falls and his mistakes. That’s the reason why I used this poetic license…. Bruno Pignatiello: Tough question Rick! Anyway, I would give more attention to music less to the image! Bruno Pignatiello: Yes, Internet is fundamental nowadays….think about all the current music sung in Spanish or Portuguese that reaches a big success: would it have been possible before the internet revolution? On the other hand I’m always a little suspicious of overexposure to social media because they take time out of real life and can lead to the brink (and sometimes over the brink as well!) of loneliness and frustration. Bruno Pignatiello: I am a person centered and grateful to life for what I received: I turn the discomfort into talent. Bruno Pignatiello: The loss of my parents, no question about it… but “I have respect for my laugh but much more for my tears” says the Brazilian artist Caetano Veloso I am aware that inside of me there is a light that guides me! Tell us something about the workings your latest release, and what your expectations are from this body of work? 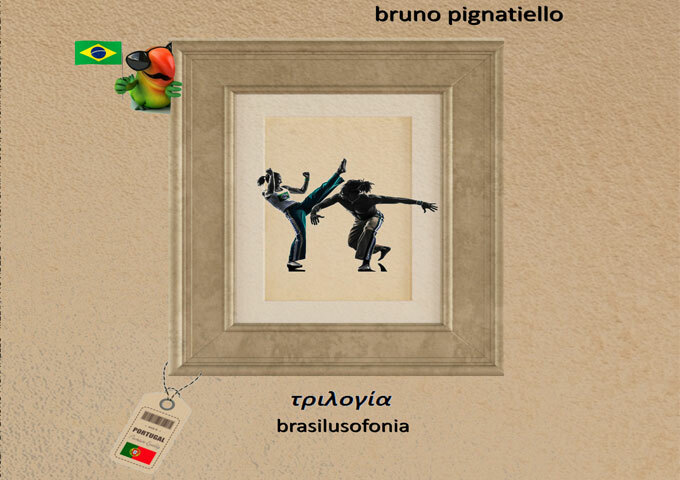 Bruno Pignatiello: My latest release is BRASILUSOFONIA which is the second volume of my TRILOGY, a tribute to my Brazilian and Portuguese soul. In this work are reported the same feelings and emotions I sing in the English and in the Italian volumes so you will find the joy, sadness, loneliness, irony, tears and laughs…. In this work I collaborated with Marisa and with some talented Brazilian musicians and singers such as Vivi Goeldi, Wagner Silva and Bruna Martini. My expectations may be high because we started the experiment to make BRASILUSONIA available initially -and exclusively – on my website WWW.SENTOLAVITA.COM where you can also support the project. What’s the next most important event planned on the Bruno Pignatiello agenda for 2018? Bruno Pignatiello: The publication of the third and last volume of my Trilogy dedicated to my Italian soul.